"Tension is causing people to opt status quo. And, that is where leaders are needed. They should have the ability to take decisions, communicate them properly and walk the talk," said Bhattacharya. Arundhati Bhattacharya, Chairman of the country's largest bank, State Bank of India. 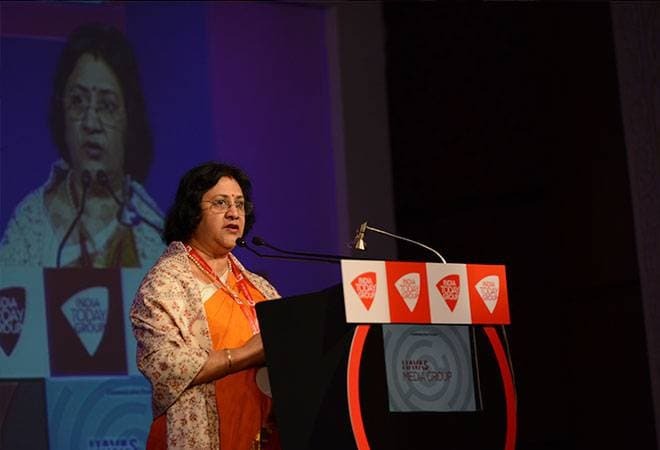 A CEO should be a visionary, have the ability to take decisions and have effective communication skills to put their organisations on the growth path in times of difficulty, says Arundhati Bhattacharya, Chairman of the country's largest bank, State Bank of India. Delivering a special address on the theme "How to take control of uncertainty by seeing through the bend round the corner" at Business Today's flagship event MindRush 2015 in New Delhi, Bhattacharya said to keep pace with the fast-changing business environment, one has to adapt to technological advancements, or face the ignominy of falling behind peers and competition. Elaborating on the CEO being a visionary, she said a successful leader should have the ability to draw the bigger picture out of a few data points in hand to prepare the organisation for the future. Bhattarchaya, who received Business Today's Best CEO award in the Super Large Company category and the Champions of the Champion award, pointed out how SBI, a public sector bank, has been ahead of time in introducing new businesses in the country. "When nobody thought about investment banking, we set up the capital market division. As far as 16 years back, we went for universal computerisation" she said. Similarly, she highlighted the importance of the ability to take quick and decisive decisions without being either autocratic or too democratic. "You give them (even the last mile operator or executive) the voice, but you are ultimately the decision maker." Effective communication was the third important piece of advice Bhattacharya had for successful leaders in times of difficulty. "For me the ability to communicate is important. I run an organisation of 220,000 people, working in the remotest locations of the country and the world. How do you get to them to be a part of your organisation? How do you get them to be a contributing member?" she said. Finally, she advocated the need to walk the talk.